 This is a sample file of a minimally encoded document of drama. 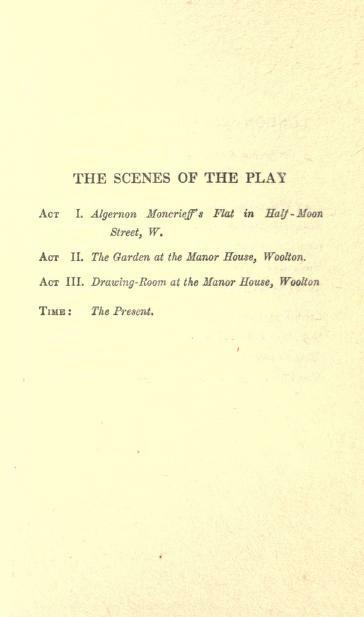 The Scenes of the Play Act I. Algernon Moncrieff's flat in Half-Moon Street, W. Act II. The Garden at the Manor House, Woolton. 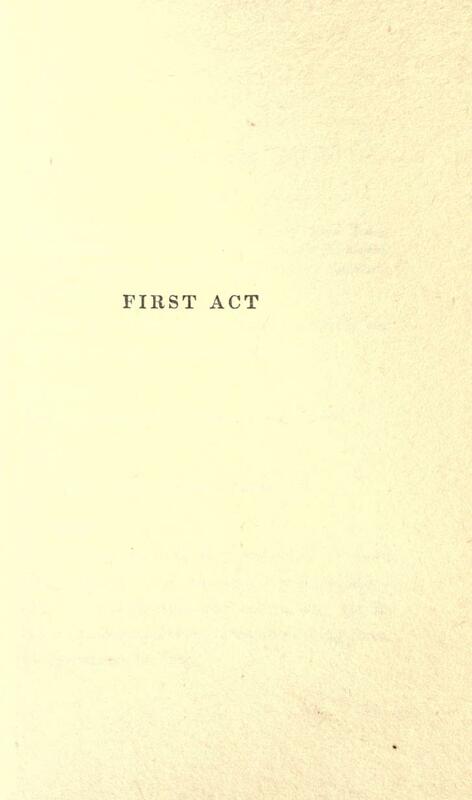 Act III. Drawing-Room at the Manor House, Woolton. Time The Present. 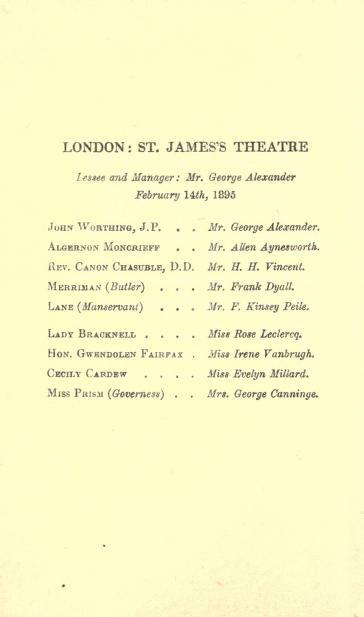 John Worthington, J.P. ... Mr. George Alexander. 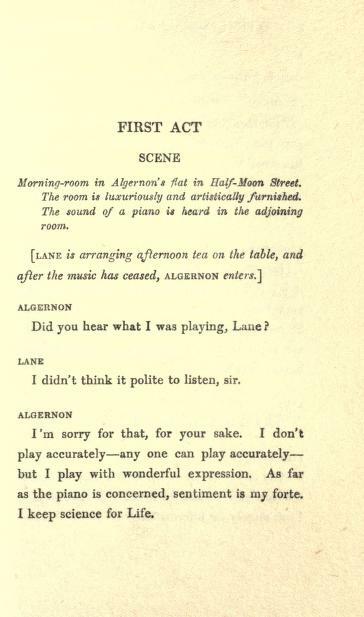 Algernon Moncrieff.. Mr. Allen Aynesworth. Rev. Canon Chasuble, D.D. Mr. H. H. Vincent. Merriman (Butler) ... Mr. Frank Dyall. Lane (Manservant)... Mr. F. Kinsey Peile. Lady Bracknell .... Miss Rose Leclercq. Hon. Gwendolen Fairfax . Miss Irene Vanbrugh. Cecily Cardew .... Miss Evelyn Millard. 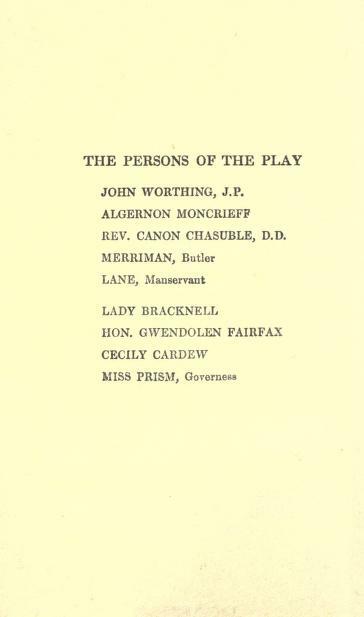 Miss Prism (Governess) .. Mrs. George Canninge Irene Vanbrugh. I don't think it polite to listen, sir. I 'm sorry for that, for your sake. I don't play accurately any one can play accurately but I play with wonderful expression. As far as the piano is concerned, sentiment is my forte. I keep science for Life.